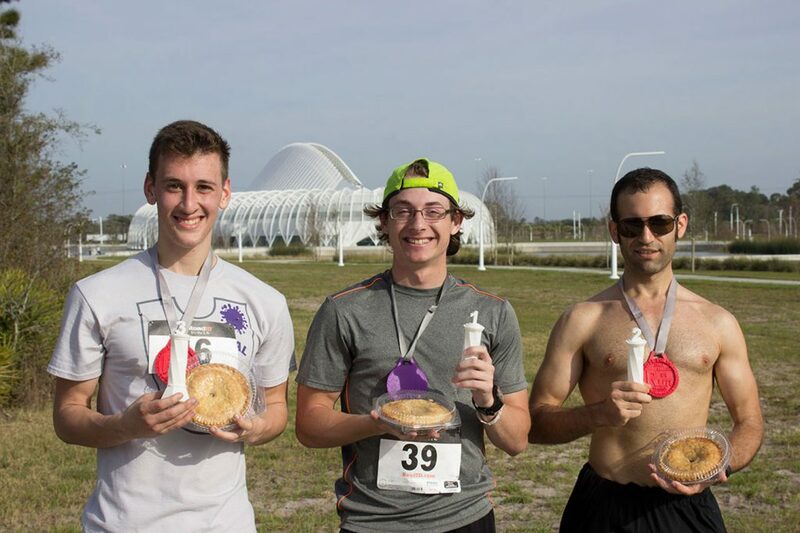 Florida Polytechnic University students organized and hosted the second annual Florida Poly Pi Run, which featured a scenic 3.14-mile course around the campus and award-winning Innovation, Science and Technology Building. More than 100 runners participated in this year’s race. The annual Pi Run was open to all University students, faculty and employees, as well as the public and helped to raise more than $1700.00 to support scholarships. Participants received a T-shirt, race bib and 3D medal produced by Florida Poly’s 3D printing lab. The Pi Run is held in honor of the mathematical constant pi (3.14), and corresponds with National Pi Day on March 14, or 3-14. Now in its second year, the annual fundraiser was created by Florida Poly’s student body to help fund student scholarships. After the race, spectators, walkers and runners alike enjoyed a slice of real pie at the finish line. In addition, first, second and third place medals were awarded to runners Cory Chambers, Leon Hurtado and Josiah Hunsinger. “Being involved with Florida Poly like this is more rewarding than any of us realize, and when I look back at what I have been part of, I will be grateful for opportunities and proud of the accomplishments,” said Brendan Burke, one of the event’s organizers and a student at Florida Poly. In addition to raising scholarship funds, the event gives members of the community the opportunity to see Florida Poly’s state-of-the-art campus and iconic main building up close.